This NNR is one of Wales' top sand-dune reserves, with all the special plants, birds and insects that depend on this type of coastal habitat for their suvival. Situated on the edge of the reserve is Kenfig Pool, Glamorgan's largest lake. The rest of the reserve consists of a large expanse of sand dunes which lead to the coast and Sker Point, with lovely views across Swansea Bay to the Gower. On the western side of the reserve is the stark horizon of Port Talbot's industrial area and steelworks - a strange contrast that only serves to highlight the wild beauty of the reserve itself. The site is managed jointly by Bridgend County Borough Council and Natural Resources Wales (NRW). 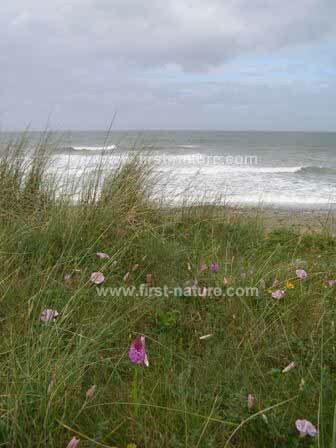 Kenfig National Nature Reserve lies on the coast of South Wales approximately one mile off the M4 motorway (Junction 37 and follow signs to to North Cornelly, Pyle and Porthcawl and thence the 'brown duck' reserve signs) between Bridgend and Port Talbot. There are some tarmac paths and a boardwalk close to the car park which offer good access for wheelchair users and for prams and pushchairs. Otherwise there are well-marked sandy tracks through the dunes and down to the sea, but be warned, it can get very hot indeed in the sand dunes during the summer months and so it is important to take something to drink if you are planning on having a long walk. Hiking through sand dunes can be a disorientating business and it is very easy to get lost if you wander too far from the tracks. 2014 - Opening times for the Visitor Centre: Weekends and Bank Holidays 10am - 4.30pm. Toilet facilities are available most of the week. Special group visits can be accommodated with prior notice to Bridgend County Council. The visitor centre has exhibits suitable for both children and adults; it is often manned by the wardens and rangers for the reserve, who are happy to answer questions and give directions to help visitors get the most out of their time at Kenfig NNR. Dotted about the reserve are interpretation boards to help with identification of various plants, birds and other wildlife to be seen there. There is no cafe but there are machines that dispense snacks and drinks in the centre, where there are public toilets (not accessible when the centre is closed). There are pubs, shops and cafes in the surrounding area. Among the many beautiful wildflowers to be found there, Kenfig is also home to several wild orchid species, notably the Pyramidal Orchid (Anacamptis pyramidalis), Fragrant Orchid (Gymnadenia conopsea), Bee Orchid (Ophrys apifera), Early-purple Orchid (Orchis mascula), Common Spotted-orchid (Dactylorhiza fuchsii), Early Marsh-orchid (Dactylorhiza incarnata) - including the rare white form pictured below - and Broad-leaved Helleborine (Epipactis helleborine), and large colonies of Marsh Helleborines (Epipactis palustris). But, the orchid-jewel in Kenfig's crown is the Fen Orchid (Liparis loeselii). Of the total number of plants of this species to be found in the UK more than 90 percent of them are found at Kenfig National Nature Reserve. Another rare orchid to be found at Kenfig is Epipactis neerlandica, and special walks are organised in late summer to see this and also Autumn Lady's Tresses (Spiranthes spiralis) which flower on the short grassland of Sker Point. 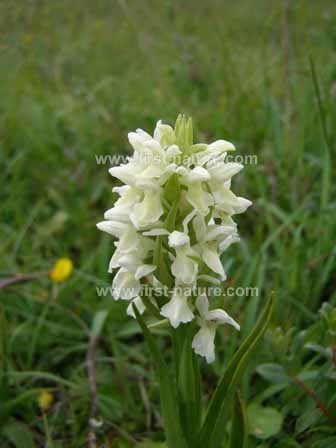 In 2011 the presence of a new rare orchid hybrid was confirmed for Kenfig National Nature Reserve. It is a cross between the Southern Marsh-orchid (Dactylorhiza praetermissa) and the Marsh Fragrant-orchid (Gymnadenia densiflora). 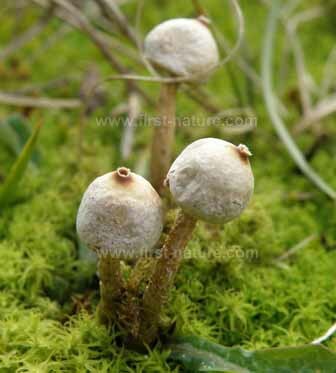 Three plants were discovered in 2009, and their identity was confirmed and reported in the Botanical Society of the British Isles's journal in June 2011. The name of the orchid is Dactylodenia ettlingeriana and recognises the work on British Orchids by Derek M Turner Ettlinger. Other wildflowers found at Kenfig NNR include Stinking Iris (Iris foetidissima), Autum Gentian (Gentianella amarella), the increasingly scarce Sea Holly (Eryngium maritimum) and many others - in fact Kenfig really is a treasure trove of rare and beautiful flowers. Any time from April onwards there are always plenty to be seen at Kenfig, and the peak time for seeing the rare Fen Orchid is early-to-mid June, depending on how good a spring we have. This reserve is also a great place to see birds. Golden Plovers (Pluvialis apricaria) can sometimes be seen, and the many wildfowl that visit the lake can be viewed and photographed from the bird hides overlooking the seventy acres of Kenfig Pool. Winter is the best time to see birds here, and several hundred Tufted Ducks (Aythya fuligula) and Pochards (Aythya ferina) move in, and the Coot (Fulica atra) population also swells to several hundred. Other species present on or in the vicinity of the lake include Mallard (Anas platyrhynchos), Common Teal (Anas crecca), Eurasian Wigeon (Anas penelope), Gadwalls (Anas strepera), Scaup (Aythya marila), Long-tailed Duck (Clangula hyemalis), Common Goldeneye (Bucephala clangula) and Smew (Mergus albellus). Occasionally Whooper Swans (Cygnus olor) and Bewick's Swans (Cygnus bewickii) pay a visit to Kenfig Pool, too. Winter is also the time that Bitterns (Botaurus stellaris) take up residence in the the reedbeds around the pool. The Pool Hide offers the best chance in Wales to see one of these rare and fascinating birds. In summer there is even a chance to seeing a Manx Shearwater (Puffinus puffinus) whenyou look out to sea from Sker Point. Gannetts (Morus bassanus), Long-tailed Skuas (Stercorarius longicaudus) and Pomarine Skuas (Stercorarius pomarinus) have also been spotted along with Roseate Terns (Sterna dougalii). Storm-petrels (Hydrobates pelagicus) occasionally turn up after particularly stormy weather. Kenfig Pool is also home to diverse aquatic invertebrates which include Caenid Mayflies (Caenis luctuosa), Damselflies, Bristleworms (Oligochaetes), Pea Mussels (Pisidium spp. ), leeches, including the Medicinal Leech (Hirudo medicinalis), water bugs and snails. The sand dunes support some rare fungi including the False Morel (Gyromitra esculenta), which despite its name is now known to be poisonous; Nail Fungus (Poronia punctata); the Winter Stalkball (Tulstoma brumale); a salt-tolerant inkcap species, Coprinopsis ammophilae, that grows among the roots of Marram Grass; and a white milkcap, Lactarius controversus. Rare invertebrates live in the sand dunes. A weevil, Tychius quinquepunctatus, and the Shrill Carder Bee (Bombus sylvarum) are there as are the Red Data List species the Solitary Wasp (Minumesa littoralis), a snail-killing fly (Pteromicra pectorosa), and a Robber Fly (Pamponerus germanicus). All in all there is enough wonderful wildife in this nature reserve to provide interest and enjoyment for a lifetime, let alone a single visit!